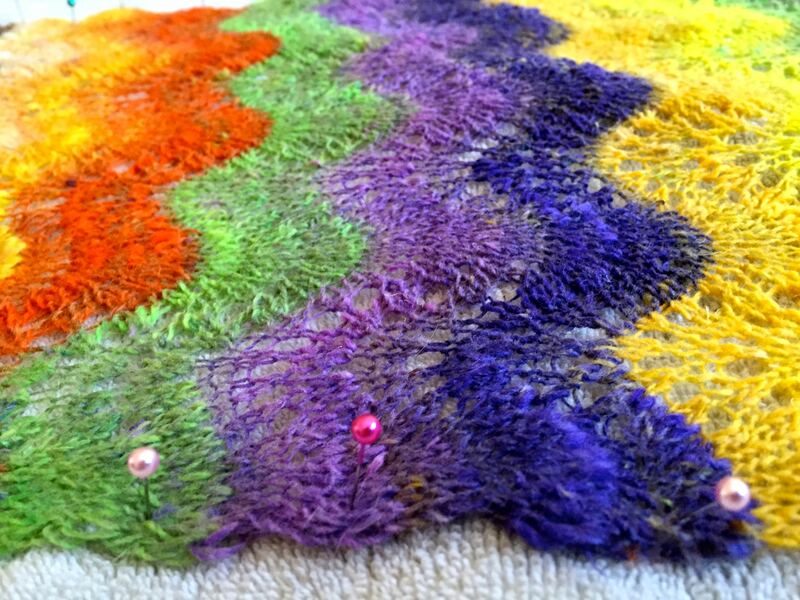 Speaking of colors, this shawl began as nothing more than a few balls of yarn. But not just any yarn, extraordinarily saturated, bright blue yarn with splashes of yellow and green. We usually have a design in hand before selecting a color pattern, but this time the yarn came first and then the design. In fact, we tailored the design to highlight the extraordinary beauty of the yarn and the way the dye was cast. The vibrant yellows and greens subtly touch the floral accents at the bottom of the shawl and cast a warm glow across the rest of the pattern. The shawl ends up with a swirl-like pattern. Measuring 31.5 inches in width or wingspan and 12 inches from neck down, it is a beautiful lightweight cotton piece. 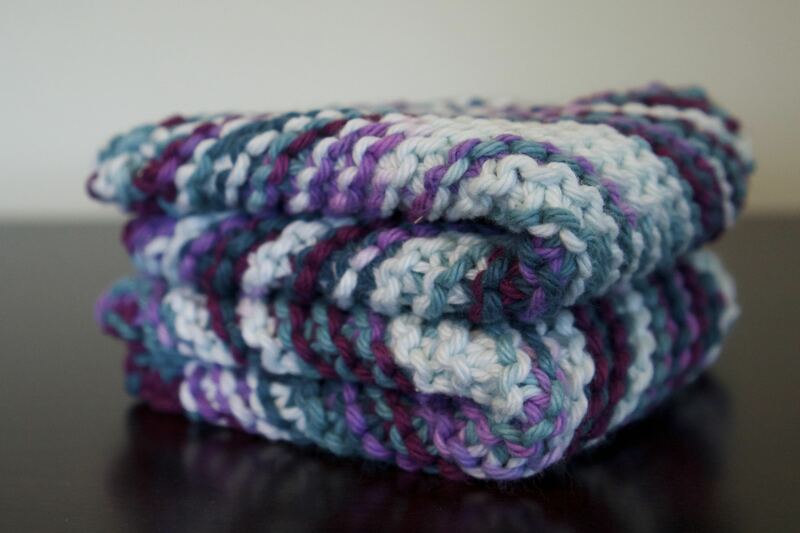 Knitting for anyone is a labor of love. Little pieces to warm and comfort babies bring extraordinary pleasure to the maker and comfort to the wee wearer. Hand-knit kids’ clothes are different; they feel refined, classy, luxurious. We have time and again knit marvelous pieces for our own children and are choosing to extend the pleasure of dressing a child in one-of-a-kind, hand-made pieces to everyone else. Here are two new designs that are ready. The first is a unisex knit-cap knitted with ultra-soft Italian merino wool with a wee-sized pom pom. Perfectly soft for a little girl and yet masculine for a little boy. The second piece is a grey, wool cardigan with white trimming for a little girl. Pearly grey buttons complete the sophisticated yet delicate look. 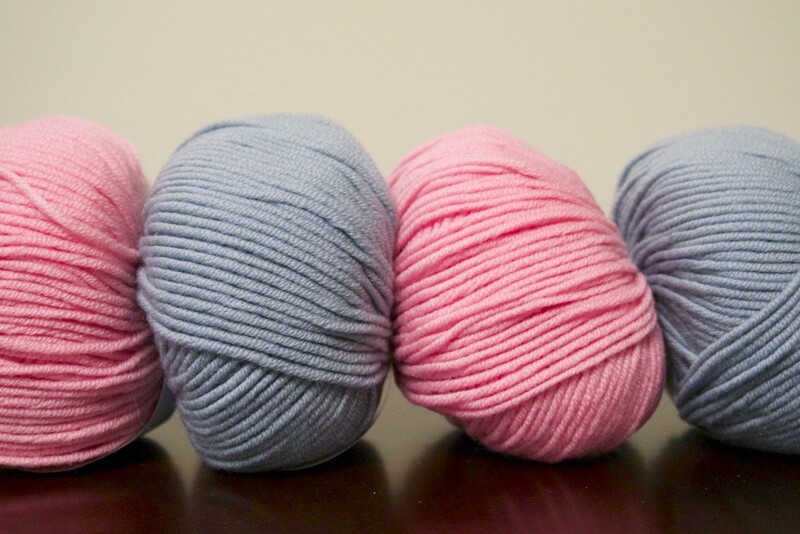 One of our very favorite things about knitting and crocheting is choosing a color palette. The anticipation of waiting for the yarn to arrive is a close second. We invest a significant amount of time in selection of yarns and colors. 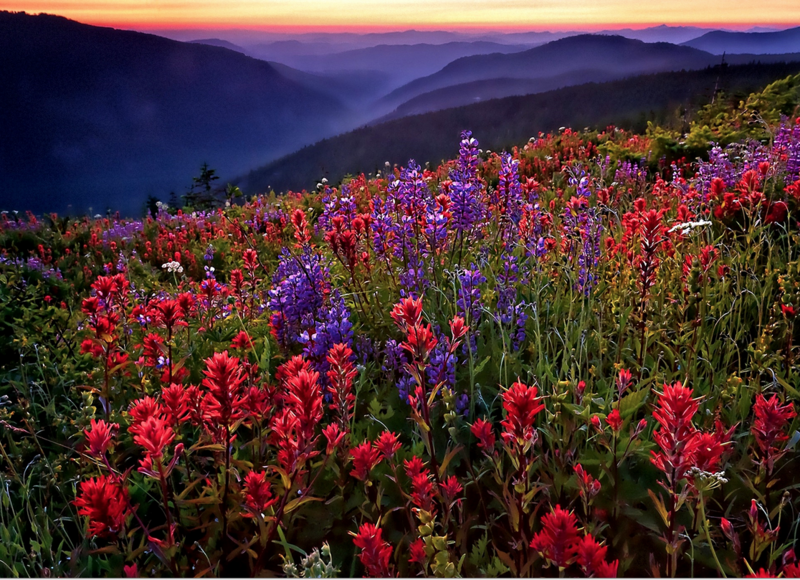 The season, design of the piece as well as nature’s palette are key considerations. Pinterest, style books, designers, images and even paintings have all been useful in our process. A close-up of a feather and fan lace scarf. Our pattern here. Yarn selection follows and we strive for natural fibers as much as possible. Not all yarns are created equal; some shag and others loose color after a while. And so, we take the time to work with well-respected yarn producers from all over the world. We’ve thus far used yarns spun in Japan, Germany and Italy in addition to those produced locally here in the USA. We do not purchase yarn in bulk as we are a small atelier striving to produce unique pieces. Our goal is to create projects that demonstrate craftsmanship and highlight the natural beauty of the yarn itself. In the end, our adventures in design and knitting are undergirded by careful selection of exquisite yarns in stunningly saturated colors. The days blur together as the winter chill keeps us inside and happily knitting. 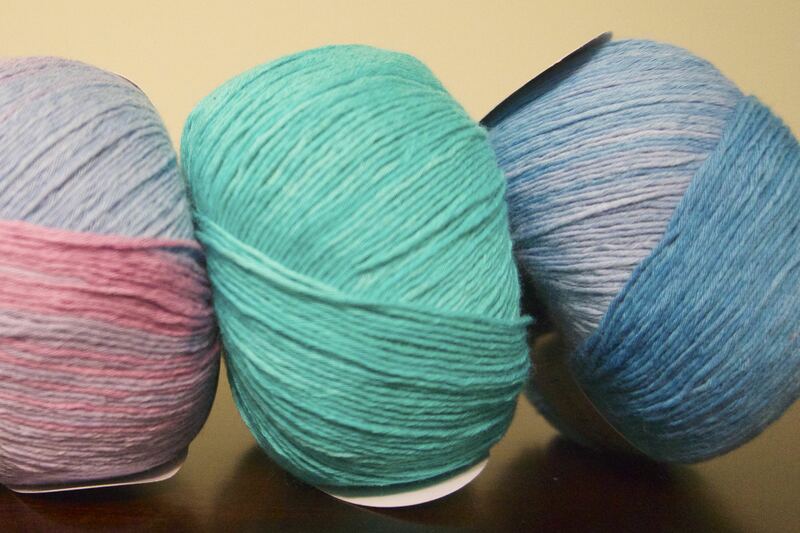 New shipments of yarn arrive often delighting us in the vibrant colors and smooth and luxurious fibers. We’re now working on our springtime collection which will feature silk, cotton and bamboo yarns. Check back soon for the big reveal! February is off to a great start with our very first sale. The ivory cowl with gold accent is no longer available as it has found a special home. Unwrapping is part of the fun of getting something new. Each of our pieces is finished off with a beautiful label and wrapped in special tissue. As in most aspects of life, looks and presentation matter. 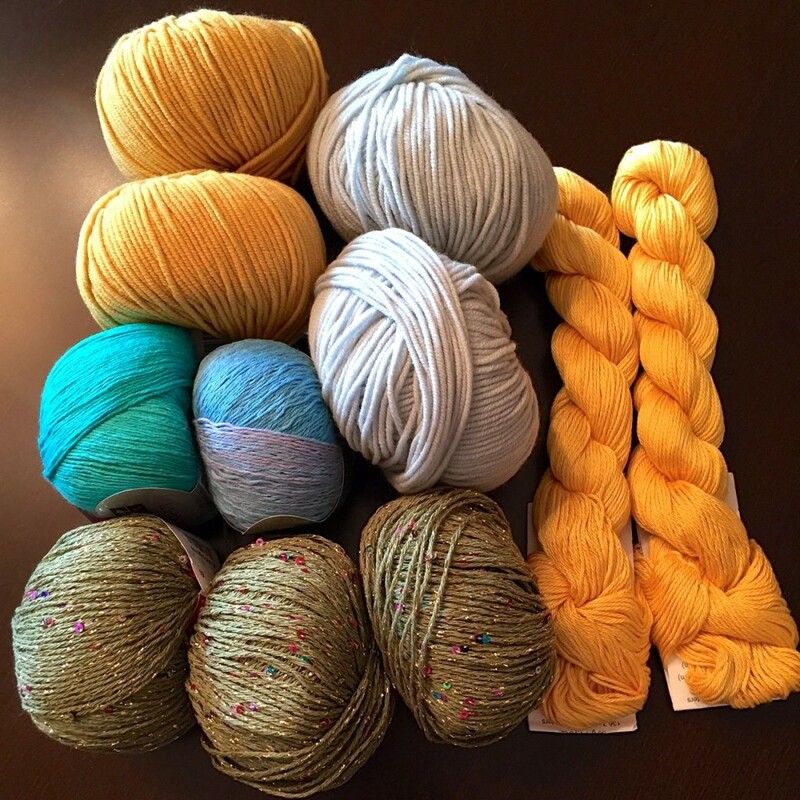 The latest highly anticipated yarn shipment has arrived and we can’t wait to get started on our latest projects. Stay tuned to see how these beautiful threads will be transformed into soft knits. If knitting is like yoga, then this project can only be described as the janu sirsasana of knitting. The big reveal coming in the next week or so! Our first projects of the year, these washcloths, were quick but satisfying. 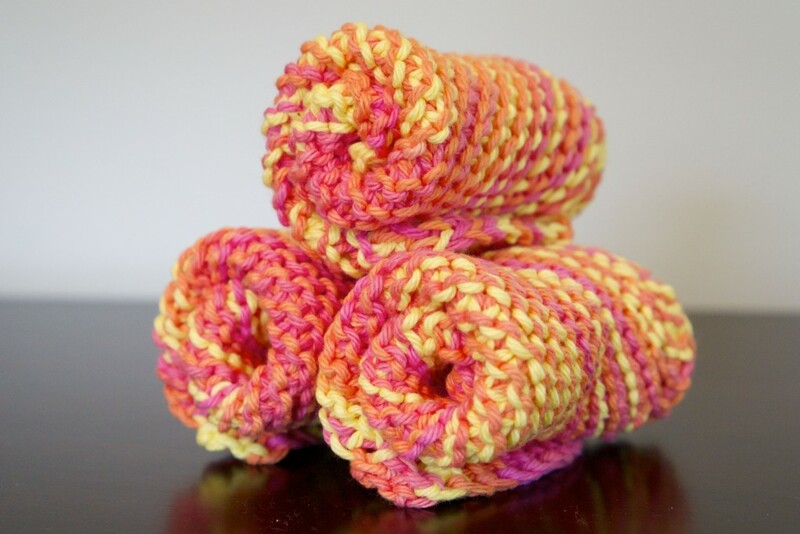 Knitted with absorbent cotton yarns, these cloths are super in the kitchen or bathroom and are what most used to use before paper towels became mainstream. They are approx. 8 x 8 inches which makes them the perfect size for dishes, faces (big and small) or body. Created with texture which helps make them more “scrubbable.” Best of all, they are environmentally friendly and easy to care for. Just pop them into the washer/dryer and re-use ad infinitum. Row 2: Knit 2, yarn over, knit across the row. Repeat Row 2 until you have 45 stitches. Row 3: Knit 1, knit 2 together, yarn over, knit 2 together, knit to the end of the row. Repeat Row 3 until you have 4 stitches left on the needle. 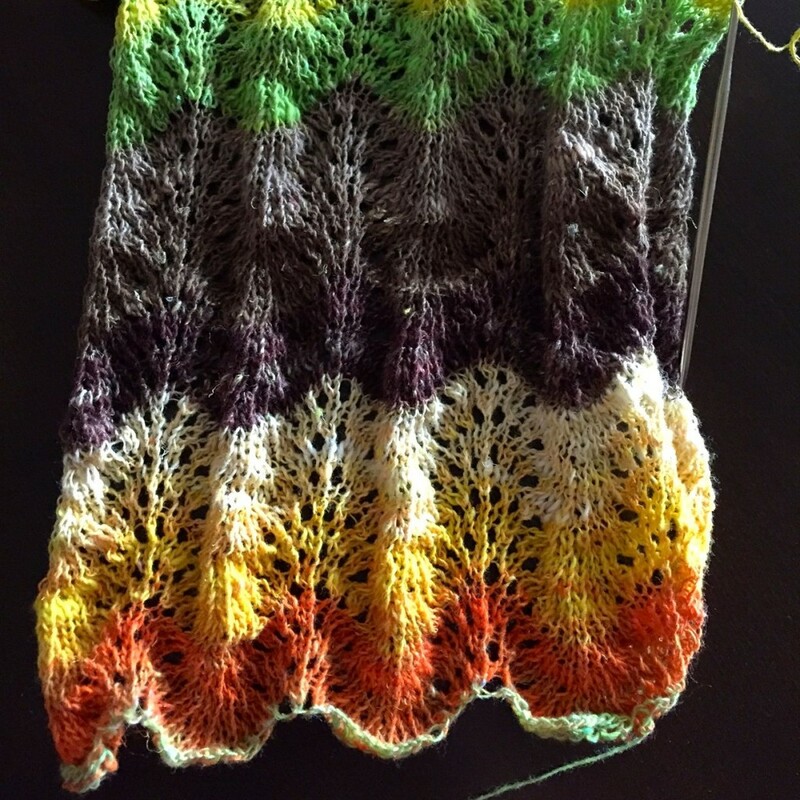 Knitting—once a necessary domestic chore, a sign of sedentary dotage, and an activity for grannies’ busy hands preventing them from too many revolutionary thoughts—is casting off its negative baggage. Nowadays, knitting has become a do-it-yourself fashion statement, a sort of an urban graffiti and a healthcare tool. Sitting down and weaving a yarn between two wooden sticks not only creates something creative and beautiful, but is one of the most life-enhancing activities around. 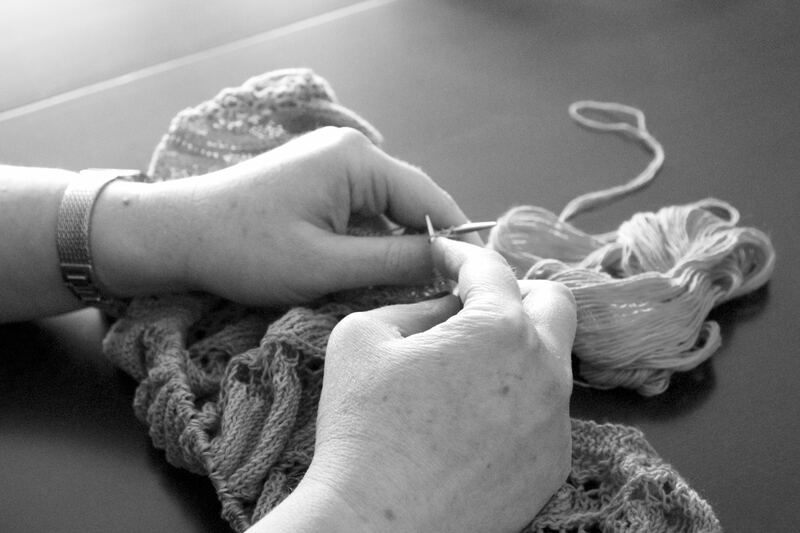 For us, knitting is about playing with patterns and colors, something that is highly addictive and satisfying. And just like with everything that experiences a rebirth, there has been an emergence of yarn snobs and to satisfy their needs, high-end yarn producers from all over the world. There is Malabrigo from Uruguay, Hedgehog Fibres from Ireland, The Wool and the Gang in England, Quince and Co., in the USA, and Istex in Iceland. 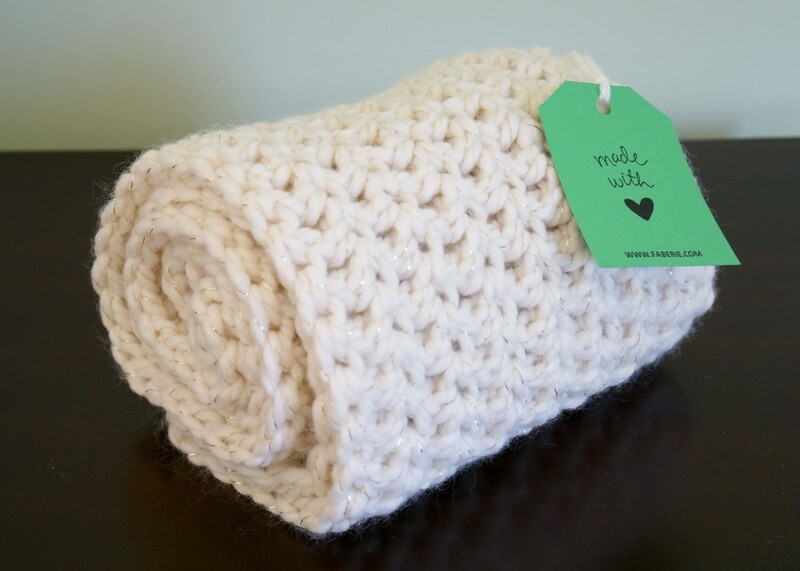 The new or re-emerged community has come together in this modern social media age with places like the Ravelry and Pinterest where enthusiasts can design and share patterns. 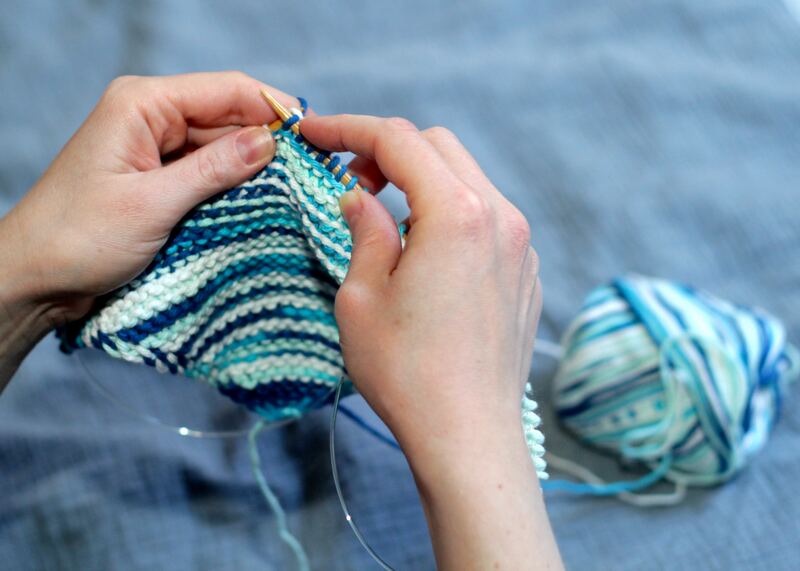 There have even been scientific articles published in medical journals discussing the calming, meditative effect and the British government has funded a 3-year study of knitting groups. At the end of the day, knitting just makes you feel good so please knit, create at leisure and all the time. Hello, welcome and thank you for visiting our little corner of the internet. Naturally you are wondering why we are here and if you read on, you’ll understand. We believe that there is value in creating something handmade. A certain quality that cannot be achieved in any other way. What’s more, a handmade object carries with it the energy of the maker, an imprint of the artist’s soul. For us, this is soul satisfying work and we are fortunate to have the opportunity to share both our process, ideas and results with you. Please join us on our journey. Like our page and get 5$ of 15$ or more in our etsy shop.